Start planning your trip to the Hockenheimring circuit for the German F1 Grand Prix in the beautiful Upper Rhine valley. The next race is on July 25-28, 2019. 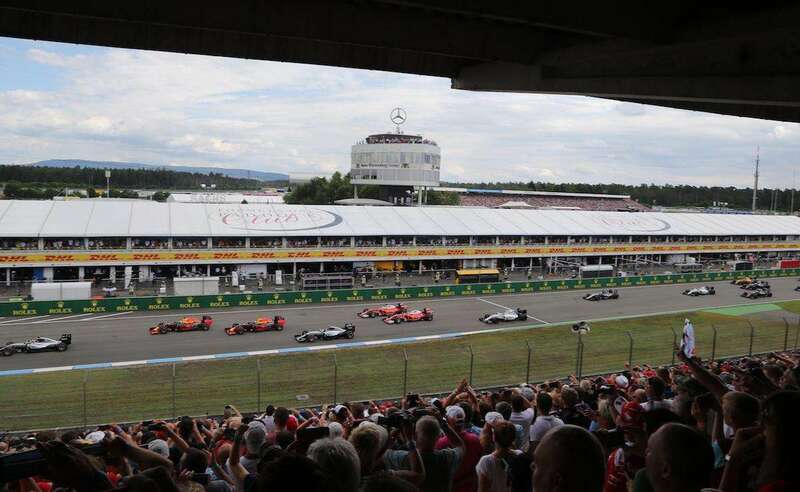 The 2019 German Grand Prix will be staged at the historic Hockenheimring circuit, which takes its name from the nearby town of Hockenheim (population 21,000). The circuit is located in the Baden-Württemberg state, part of the Upper Rhine valley region that straddles Germany, France and Switzerland. Nearby cities include Mannheim (20km), Heidelberg (25km), Frankfurt (100km) and Stuttgart (130km). Germany is part of the Schengen Area, which offers borderless travel between 26 European states. The good news is that citizens of over 60 countries do NOT require a visa to enter the Schengen Area for up to 90 days; exempt countries include Australia, Canada, USA, New Zealand, Japan & Malaysia. Click here for a list of the countries whose citizens are required to get a Schengen visa and to find out more about how to apply. As always, make sure you have adequate travel insurance in place for your trip, including a provision for emergency medical treatment. Should you fall ill, the quality of healthcare in Germany is very high. Ask your hotel to help organize a doctor’s visit or visit the nearest pharmacy (Apotheke). Even the smallest towns will have a 24 hour pharmacy and English is widely spoken. English is widely spoken in Germany, especially in larger cities and among young people. You may encounter some difficulties in Hockenheim or small towns nearby; learning a few German phrases and having a smartphone translation app at the ready will help and could also make you some new friends! Click here for some useful German phrases. Germany is a very safe country for tourists, with very low rates of violent crime. Petty thefts and pick pocketing do occur however, especially in larger cities. Keep a close eye on your belongings in crowded situations, such as on public transport or at the track. Be careful with your alcohol consumption at the track, and steer clear of drunken fans looking to pick a fight! The German Grand Prix is held at the height of the European summer. You can reasonably expect warm, sunny weather at the Hockenheimring. The average daily temperature range for July in Hockenheim is a maximum of 26°C (79°F) and a minimum of 16°C (61°F). Rainfall is not uncommon however, so pack a poncho or light rain jacket in addition to your hat and sunscreen. Germany uses the EURO currency. Credit cards are widely accepted and ATMs are easy to find. Germany operates on Central European Time (CET), which equates to GMT +1 hour. The number to dial in case of an emergency in Germany is 112. Work out the cost of your trip to the 2019 German Grand Prix at the Hockenheimring on July 26-28. Germany is home to the all-conquering Mercedes AMG F1 team plus 4-times World Champion Sebastian Vettel. It has two iconic tracks; the Hockenheimring and the Nurburgring. The best things to do away from the track at the 2019 German Grand Prix, including the Mercedes-Benz and Porsche museums in Stuttgart. How to get to the Hockenheimring for the 2019 German Grand Prix on July 26-28, including detailed info on trains and driving to the circuit. Where to stay near Hockenheim for the German Grand Prix. This year’s race is on July 20-22, 2018. 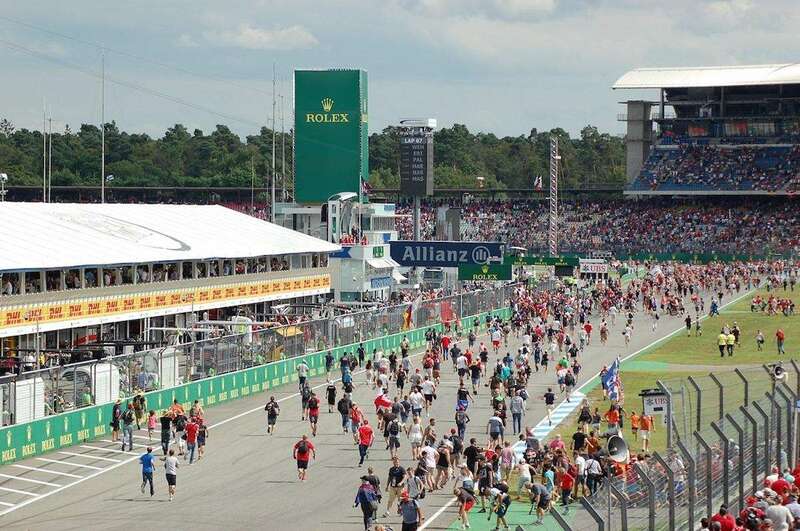 Your guide to buying tickets and the best places to watch the action at the Hockenheimring for the 2019 German Grand Prix on July 26-28. Get the most out of your trip to the 2018 German Grand Prix on July 19-22. Here’s our trackside guide to the Hockenheimring, including the full on-track timetable. 1- When would the german F1 race starts on Sunday? 2- At earliest time or as late as possible time to reach to track? 3- After the race finishes, can we go to track to reach closer to podium to see podium ceremony? 4- What else can we do on race day, like are the drivers going to visit the grandstands and how is it possible to get autograph or a picture with them. Anything else exciting that i could do on race day, like coming in early would give me any benefit or staying late would give me the chance to meet the drivers or something like that. Would really appreciate if you could guide me as being newbie.